The Flatline was neither a human nor an artificial intelligence, but a machine that partially emulated how a human thought. It did a pretty good job, too, playing the central role of “smart guy” in the novel’s main cyberpunk-heist plotline. Yet it wasn’t a perfect human emulation: its laugh was “wrong,” and it was self-aware enough to note its own lack of creativity. Turning its ROM disk off and back on again totally reset Dixie’s memory, and later in the story the villain tried to take out Case first (still alive and human) precisely because the Flatline was a machine, and therefore much more predictable. “Encoding” a human thought process into a computer. It’s hard to “teach” computers directly. Most machine learning algorithms learn by example (i.e., observational data) but there aren’t great ways for people to inject their instincts about a problem into the machine. If we have a good cognitive model that captures properties of our thinking, though, we can perhaps encode that more directly into a learning algorithm. Understanding how people think. If a computational model predicts real human behavior pretty well, then there’s a chance that it captures something real about how we think. And if its parameters are easily interpretable, we can gain insight into how our brains work, too. K.S. Jun, X. Zhu, B. Settles, and T.T. Rogers. Learning from Human-Generated Lists. Proceedings of the International Conference on Machine Learning (ICML), pages 181-189. 2013. Most supervised machine learning algorithms take data as input → output pairs, and “learn” how to map inputs to outputs from statistical regularities in the data. Consider text classifiers like the ones that filter your email or classify online product reviews as positive or negative in sentiment. 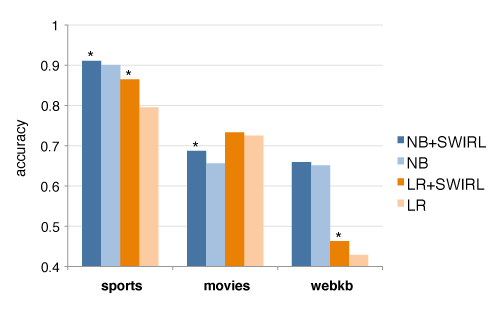 These classifiers are usually “trained” using hand-labeled texts; and it often takes a ton of these texts before all the statistics can do a good job of teasing out which words predict which category labels. But you already know that “excellent” indicates a positive review and “horrible” indicates a negative one… even before anyone labels any text! The past five years (or so) we’ve seen several new semi-supervised learning algorithms that use this kind of human “domain knowledge” together with a ton of unlabeled text. People can generate word lists for each category label, which can then be converted into priors for naïve Bayes (Settles, 2011) or constraints for logistic regression (Druck & al., 2008), among other things. This chart compares naïve Bayes (NB) and logistic regression (LR) classifiers on three data sets using semi-supervised word-labeling algorithms. The only difference is whether the priors (for NB) or constraints (for LR) were created using the SWIRL s parameters or a previously-published method. In nearly all cases, SWIRL is better and the gains are statistically significant (asterisks). This is an exciting step toward machine learning algorithms that benefit from cognitive models of how people think about the problem. 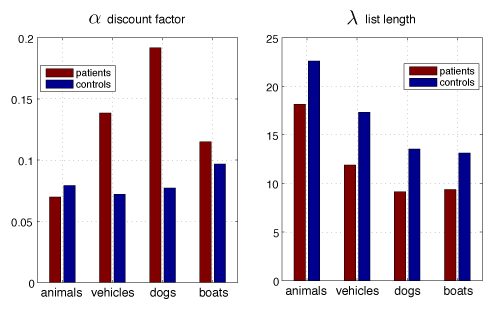 According to the SWIRL models, patients (1) repeat words more often with larger α and (2) produce shorter lists with smaller λ. Both of these are consistent with — and provide quantitative evidence for — the psychological hypotheses mentioned above. For the most part the patents’ α parameter is larger than the controls, meaning their “word sizes” shrink less after being listed (which makes them more likely to be repeated). However, the word size parameters s do not differ much between the two groups, suggesting that both healthy and brain-damaged individuals have the same “mental distributions” over words in these categories. So brain injuries might not alter what the patients know as much as how they recall it. SWIRL can also do a pretty good job of predicting whether people have epilepsy or not simply based on the lists that they generate. I’m excited about this new courtship between cognitive modeling and applied machine learning. Even if we are still decades away from psychological constructs like the one in Neuromancer, there is a lot of potential today in using simpler cognitive models and machine learning to encode human thought processes into computer systems. This seem to quantitatively confirm cognitive misery and category model classification, namely that each category of distinct things and ideas have a prototype model, which serves as an automatic/tautological identifier, which is automated to the point of not requiring conscious analysis (hence cognitive misery). And that category-founding object is where all the other objects of the category stem from and as they move away from the basic qualities of the model object they are reduced in relation but gain more saliency as the atypical object, the consequence of which is a delayed recall and the need to employ more cognitive resources to retrieve such an object. Would “word size” as a cognitive model relate at all to the spreading activation model? Semantic networks would explain why people list related words in sequence (fish, crab, lobster, etc. ), as well as why people begin with more prototypical items, as their connections to the concept “animal” are more heavily weighted.